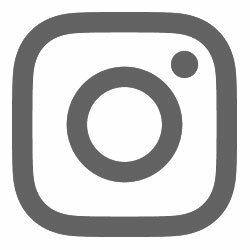 As a nanny, I love taking my charges to children’s theatre. 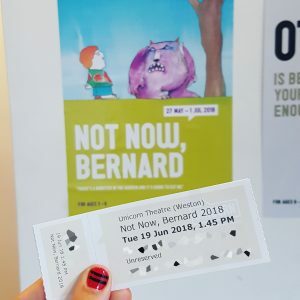 Having loved the book, we went to check out the Unicorn Theatre’s production of Not Now, Bernard. The Unicorn Theatre hosts quite a lot of children’s theatres and is well set up to cope with little visitors. They have a large cafe to hang out in before or after shows with child friendly food and drink options, and everything seemed very well organised. The theatre itself is quite large with lots of seating, and seemed to be well suited for smaller visitors being able to see what’s happening. 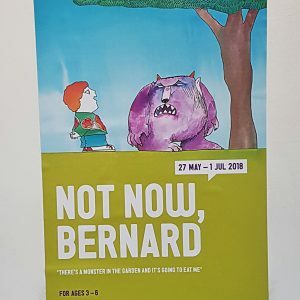 For Not Now, Bernard, the stage was set up very cutely with a living room in the front, a kitchen and Bernard’s bedroom further to the sides, and the garden enveloping the entire space that is just open with no walls. The stage design was cute and basic enough for young children, and of course very colourful. The story of the book was acted out very accurately and had the little theatre goers fully engaged, especially the dinner scene had them absolutely in stitches. I thought this production was really cute and well done, it was a joy to watch. Four and a half rainbow sloths from me!